Synopsis: The amazing true childhood story of basketball's greatest showman. The greatest gift a parent can give their child is a dream. 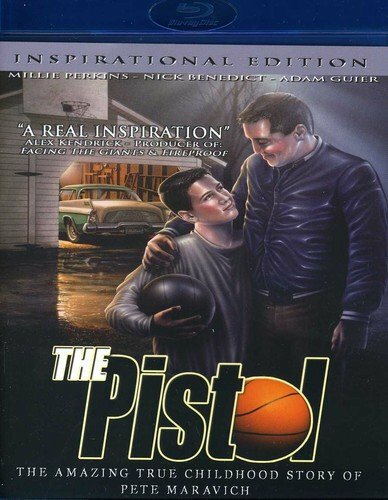 The Pistol is the action-packed, heart warming motion picture about the dedication of a parent to his child and the devotion of a boy to become the greatest basketball player ever. Filmmakers Darrel Campbell and Rodney Stone go to great lengths to bring Pistol Pete fans this re-mastered sports classic, sure to be a great addition to any family movie collection. The Pistol is the uplifting story of a scrawny eighth grade boy whose stunning basketball skills earn him a spot on the high school team! Unfortunately for young Pete Maravich (Adam Guier), his style of "Showtime" basketball is way ahead of its time, making him the target of ridicule and socially separates him from his teammates. Against all odds, Pete perseveres with the constant encouragement of his mentor and father, Press Maravich (Days Of Our Lives' Nick Benedict) and the love of his mother Helen (Academy Award Nominee Millie Perkins). But Pistol Pete's life was about more than basketball. Watch the Inspirational bonus material to learn what made this NBA All-Star and Hall-of-Famer one of the most admired and respected athletes in the world.